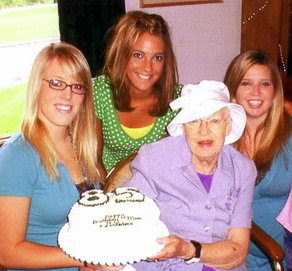 This is one of the last pictures of my sweet mother-in-law Edith, with some of her granddaughters on her 85th birthday. 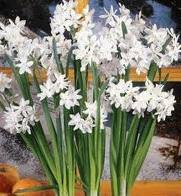 Edith used to force bulbs in a dark closet, so that she could have a pot of paperwhites on her table at Christmas time. 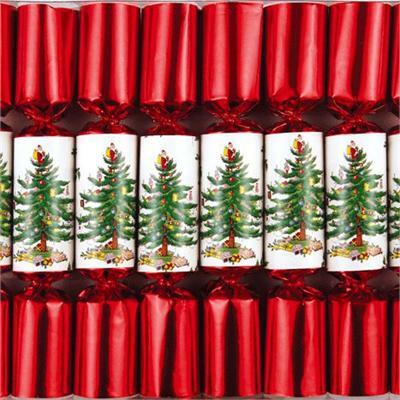 Mom was English and she always had English Crackers for the kids to pop open at Christmas. They had paper crowns and toys inside, and when you pull the ribbon on each end they pop! 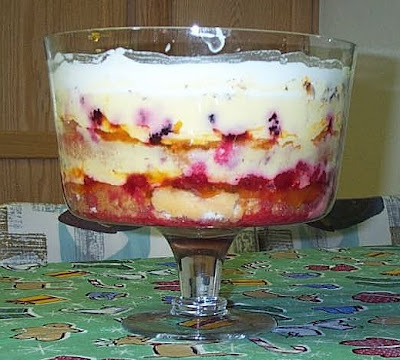 One of my favorites over the years was Mom's English Trifle. Yumo! 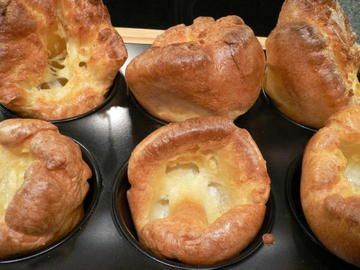 Another favorite for everyone were her Yorkshire Puddings which she filled with beef gravy when she made a roast. 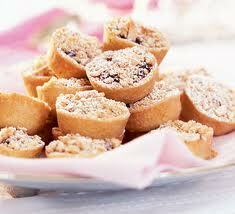 And some of us loved her mincemeat mini-pies! Holiday tables at Mom's house were always filled with wonderful food! Everyone loved to gather in the kitchen when mom was dishing up the dinner. What amazed me is how there was always plenty for everyone even though she had her 7 grown kids, their wives and kids, and often additional family members and friends there. There were always leftovers and plenty of desserts too. Some of my jobs over the years were making the relish tray, peeling potatoes, and setting the table, filling the water glasses, and then helping clear the table and helping with the dishes. Just little jobs because Mom did most of the actual cooking. Some of the local relatives would bring some side dishes or additional desserts, but Edith was the queen of her kitchen! After dinner she always served hot English tea with milk and sugar. Mom loved her tea times since she was from England, and we all enjoyed sitting around the table with tea and desserts telling stories and laughing together. Sometimes mom would get to laughing so hard over the memories that she'd laugh until she cried. Which in turn would make all of us laugh too. My husband is her oldest, and he was born in England during the war. So after the war was over, she and John came to America on a ship with 1100 war brides and their babies. My father-in-law had already been shipped home. They had six additional children over the years in a small town in Nebraska. She was a wonderful wife, mother, grandmother and friend, and everyone loved her accent and her English traditions. I loved Christmas at Mom and Dad's, and one thing I really enjoyed was her very old fashioned Christmas tree. And I loved hearing her sing Christmas Carols as she cooked. Or she would listen to Roger Whittaker on her record player, as he was her favorite singer. Mom and dad owned a grocery store after their kids were older, and it is still in business even though both of them have passed away. Three of John's siblings run it now, but Mom and Dad's presence is still felt when you walk into that store. They worked so very hard for so many years to make it into what it is today. So many things remind me of Edith, and I have such love in my heart for her. 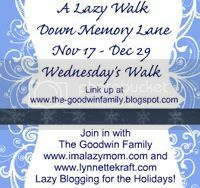 Today for Wednesday's Walk Down Memory Lane I just decided to do a post in her honor. Link your Memory posts by clicking on the button above. Wait! Those Yorkshire Puddings are what we call Hootenanny Pancakes on my blog! I've heard a lot about this English version though after posting it! What a great post honoring your dear mother-in-law! Love all the photos of that delicious food. Used to make that delicious trifle too, way back when, but never had such a gorgeous bowl for it. YUM on the Yorkshire pudding! Such wonderful family memories are a real blessing! What an amazing post! I've always been fascinated with English culture...the food, traditions, royalty, etc. And what a legacy that their store is still open today! What a wonderful post. What a wonderful lady. Great food too. I enjoyed reading this !! Thanx for sharing !! She sounds like someone I would've really liked! What delightful memories!! They just cheered my day right up!! Hope you are well. We had some snow up our way yesterday. What a loving and tender post! What a blessing to share life with such a wonderful mother in law. I would love to know if you ever post about that trifle recipe! I was late getting my post up, but I finally did...this morning. I guess it fits well with the "lazy" theme! I just loved reading about your MIL. She sounds like a fascinating and wonderful lady. I think that is so neat that she was from England. I have a friend who's husband is from England and when you get the two of us together, he with his english accent and me with my texan accent, it's a wonder we can even communicate. Haha! What a sweetie of a mom-in-law you were blessed with. My mom's name is Edith!